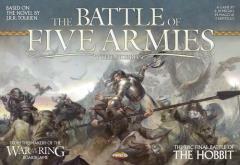 The Battle of Five Armies based on the climax of JRR Tolkien's novel The Hobbit pits the hosts of the Elvenking, the Dwarves of Dain Ironfoot, and the Men of the Lake led by Bard the Bowman against a horde of Wolves, Goblins and Bats led by Bolg, son of Azog. Will Gandalf turn the tide for the Free Peoples? Will the Eagles arrive, or Beorn come to the rescue? Or will Bilbo the Hobbit perish in a last stand on Ravenhill?